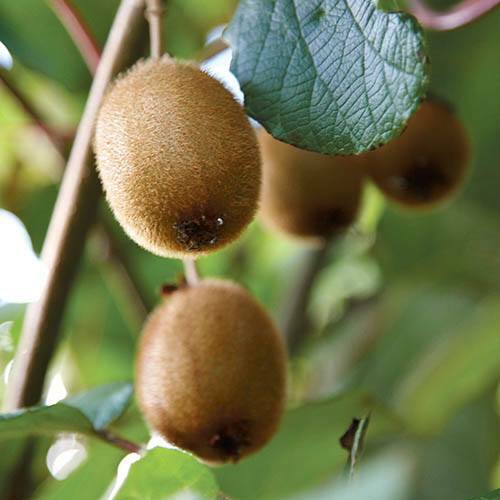 Grow sweet, juicy, healthy kiwi fruits in your garden with increasing crops year after year. This is a reliable, self fertile variety which does not need another kiwi plant nearby to produce fruit. Plant in a sunny position and water well especially during the warm summer season. The flowers will blossom in early Summer with the fruit forming ready to crop late Autumn. Supplied as an established Kiwi plant in 2L pot 30-40cm tall, plant out all year. What's not to like about easy-to-grow Kiwi fruits, which can crop reliably outside here in the UK? The variety 'Jenny' is tried and tested as one of the best performers in UK gardens, and is 100% self-fertile. This gets round the problem most people have had, as you typically needed a male and female variety to get crops, and then some bees to pollinate too. That, however, is now in the past! Grow against a sunny, south facing wall, 'Jenny' is quite vigorous, and can reach 3-4M in 5 years if not trained or pruned. The good news is it responds well to trimming and shaping, and should produce fruit in 2-3 years reliably, and heavy crops beyond that, surprisingly easily. Juicy, fresh and rich in Vitamin C, the fruits can be picked in Autumn, and are delicious eaten fresh - quite different to supermarket fruits chilled and transported across the globe.